Tan, Yulita (2005) Dukungan keluarga terhadap kesehatan fisik dan mental pada individu dewasa akhir. Skripsi thesis, universitas Tarumanagara. "Adult healthiness were influenced by many factors such as genetic factor, nutrition, live style, and environment where they lived. 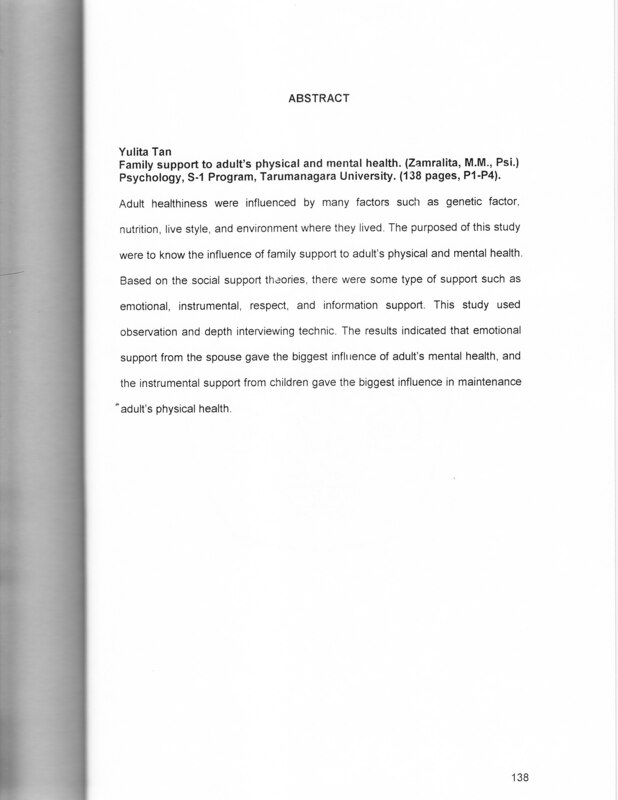 The purposed of this study were to know the influence of family support to adult's physical and mental health. Based on the social support theories, there were some type of support such asemotional, instrumental, respect, and information support. This study used Observation and depth interviewing technic. The results indicated that emotional support from the spouse gave the biggest influence of adult's mental health, and the instrumental support from children gave the biggest influence in maintenance adult's physical health. "